A 1080p version of the video is also available to view here. This was our second day diving with Danny, and he suggested a dive at Sistema Camilo. This is just off the Tulum–Coba road and, whilst I had passed it many times on the way to places like Cenote Carwash, I’d never been in before. The Cenote we were diving from (Cenote Muchachos) apparently used to be quite small as you can see from these photos, however it had only very recently been reopened to divers after the landowner had completed (well almost completed!) a series of “improvements” to the Centote. Quite how you “improve” upon 65 million years of geology I’m not sure, but in the space of a few weeks, and with a little help from some earth-moving tools, the place was now an island with a circular lake all around it. I’m sure it will be quite nice once it’s tidied up and the vegetation has grown back, and whilst I hope the landowner makes a little more income on his land from hiring it out, one can’t help but wish he’d just left it alone. Much of the original exploration of this system was done in the early part of this century by the Cambrian Foundation. The line and markers were very well organised and much of this is still in place meaning it’s a pleasure to dive from a navigational perspective. Cenote Muchachos was named after the teams of local volunteers (“muchachos” or “boys”) who helped the Foundation to carry equipment into the jungle on the early expeditions. 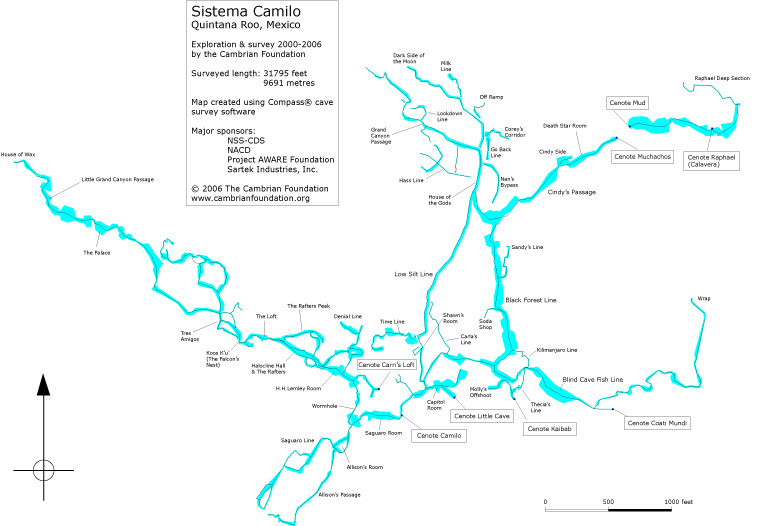 The ongoing exploration of Sistema Camilo is now being continued by John Sampson and Karen Cleveland from Phoenix, Arizona, who were doing a dive in the system (a pretty long one too!) on the day we were there. Had I known this at the time, I might have tried putting them in the film too! Very different to our previous day’s dive, this cave has darker, richer hues in the rock. Predominantly brown but with a multitude of shades it makes for a more varied and interesting dive in many ways to some of the whiter more highly decorated caves in the area. The two areas that we chose to film from our dive were The Grand Canyon and The Black Forest. The Grand Canyon is a spectacular slot canyon which has the line high up in the fresh water zone with the floor in the salt water layer. The two meet at what’s called a halocline, and swimming through this interface mixes the two densities of water creating a shimmering blurry patch of water. Both beautiful but also potentially disorienting, the halocline can be found at different depths depending on how far the cave is from the coastline (the fresh water layer sits like a curved lens on top of the salt water which is found deeper the further you travel inland). Being someway outside Tulum, itself a little way from the coast, the halocline in Sistema Camilo is relatively deep for Mexico, at around 21 metres. The Black Forest line can be accessed by a jump off the main line. Leaving the main tunnel behind, the character of the cave quickly changes into smaller passage with more decorations, all dark brown or black. The name is very well chosen and the place does have a Brothers Grimm-like enchanted quality to it, which hopefully comes through on the film. The underwater footage was, as usual, shot with the Canon 550D with the Cinestyle colour profile from Technicolor. Since my last filming trip though, the added Magic Lantern firmware I use has been updated to allow for one style to apply during normal liveview mode and another to automatically apply just when it’s recording. This is enormously useful underwater when time is not a luxury you have and keeping unnecessary button-pushing to a minimum is a good thing. I’m now able to view the scene with the Neutral picture style when setting up the shot (which gives a better approximation of the contrast and levels that will apply after I colour grade the footage), but then not have to remember to switch to (or fiddle around with) the flat Cinestyle profile before hitting record as the camera does it automatically when you press the record button. Another very useful feature of the newer versions of Magic Lantern (especially underwater) is the Custom notification for recording and standby. It’s not always immediately obvious when looking at liveview though the window on the housing and through a dive mask whether you’ve actually hit record or not (especially as the little red record dot is near the top of the screen and hard to see if your line of sight is higher than the screen). Now you’re able to show a big red crossout graphic right across the middle of the screen when in standby (i.e. not recording). This now completely removes the idiot-behind-the-camera factor and the resulting paranoia I sometimes used to get after capturing a nice sequence then panicking slightly that I might have forgotten to press record! Back in the computer, the interview section of the film required a little more fiddling than I ideally wanted. On that day in Mexico, it was cloudy with patches of sunlight, and after having set up the shot and exposed for bright sunlight, the sun went behind a cloud almost immediately after Danny began talking! The shot, now a couple of stops underexposed then went up and down as the clouds passed by. On location, I was a bit pressed for time and didn’t have the heart to make Danny repeat his piece to camera, but I did have an idea that I would be able to fix the shot in post. In the end it kind of worked: I took the exposure down from the opening shot and up from the darkest point, then added keyframes to ramp the effect between the two to match the changing light levels. It’s not perfect, and I could’ve spent more time on this (including, matching the levels on the scopes instead of just eyeballing it), but hopefully no-one would notice too much were it not for my mentioning it here. And yes, I do realise that a “normal” video camera would’ve had no problem automatically adjusting for the changing light, but where’s the fun in that!